Anatoly Artamonov, Kaluga Region Governor, Alexey Kozlov, SIBUR CEO, Horst Schmidt, Karl Schmidt Spedition GmbH & Co CEO, and Nikolay Kruchinin, Freight Viillage Kaluga CEO, concluded an agreement on development of a polymer processing cluster in kaluga Region. 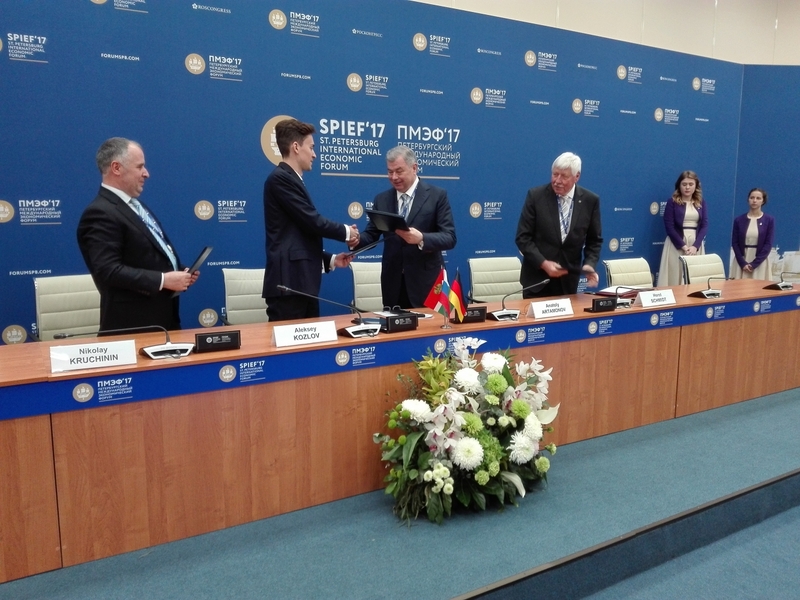 The agreement was signed at Saint Petersburg International Economic Forum on June 2, 2017. In accordance with a preliminary agreement the parties are to establish a major distribution center in Freight Village Vorsino. It is to process polymer products delivered by container trains from ZapSibNeftekhim plant being constructed in Tobolsk. The products will be packaged, stored and delivered to customers both in Russian and abroad. The centers annual capacity will be 670,00 t. Over 40,000 t of polymers will be simultaneously stored at a container storage site and in the modernized warehousing facility. KSS is to invest over RUR 2 billion in the project. Anatoly Artamonov expressing his positive view in the event, said: “We have signed the agreement, which is of great importance for all parties. We are interested in its implementation for a number of reasons. One of them is the ability to use the existing capacities of Freight Village Vorsino to a maximum extent. Kaluga Region Government will do its best to implement the project within the shortest possible time”. Governor Artamonov also noted that the attraction of investments to the region and creation of new efficient jobs are essential components of Vladimir Putin’s economic policy. Alexey Kozlov noted that Kaluga Region is the most attractive place for such a project’s implementation from geographical point of view. He said: “Kaluga Region is a home for successfully developing companies of automotive cluster, biotechnology cluster, pharmaceutical and medical services’ cluster. All these industries are polymer products’ consumers”. Horst Schmidt added: “KSS introduces advanced logistics technologies in Russia. They help optimize processes both for polymer manufacturers and processors. We have been cooperating with SIBUR for many years. We have already implemented projects providing for construction of logistics platforms for RUSVINYL and ZapSibNeftekhim. We are glad to take part in creation of the new facility in Kaluga Region”.